Arrested Development Season 5 is finally available for fans to stream right now on Netflix! 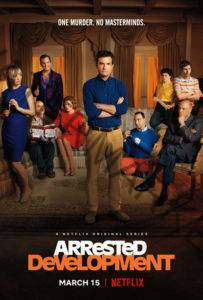 Emmy award-winning and Golden Globe nominated comedy series, Arrested Development, returns to Netflix for a fifth season. The first half, consisting of eight episodes, premieres on Tuesday, May 29th and the remaining eight episodes will launch at a later date. As this Netflix (semi) original series, the Bluths are back together, and finally getting the award they think they deserve – for family of the year. A development which will help Lindsay as she begins her campaign for Congress, to become ‘part of the problem’. But whatever happens, Michael will always come back to save the family. Probably. Meet The Wildly Dysfunctional Bluth Family. This Family Was Once At The Height Of Real Estate Development In Orange County, California. But When The Family Business – The Bluth Company – Goes Bust, They’re Suddenly Found Penniless With Their Assets Frozen. They Move Into Their Last Remaining Asset – The Model Home Left Over From Their Latest Housing Tract. Their Luxury Vehicles Are Replaced With A Reminder Of The Family’s Former Wealth: ‘the Stair Car That Accompanied Their Private Jet’. The Patriarch Of The Family Is George Bluth – He’s Now In Prison, And Loving Every Minute Of It. His Wife Lucille And Daughter Lindsay Are Spoiled Socialites Who Can’t Handle Getting Kicked Out Of Family Restaurants. His Son Buster Is In His Mid 30’s And Lives At Home. His Son George Oscar Bluth Is A Magician Who Started A Group To Get Magicians To Be Taken Seriously, And Gets Kicked Out When His Own Tricks Are Revealed. Lindsay Is Married To A Man Named Tobias Funke, Once A Psychiatrist. Arrested Development Season 5’s Netflix Release Date is March 15, 2019. If you like what read about Arrested Development Season 5, please remember to share Netflix New Releases on Facebook, Twitter or wherever you guys want it’s all appreciated.